In Rebuild from Depression: A Nutrient Guide including Depression in Pregnancy and Postpartum, Amanda Rose shares the story of her battle with depression and how she found healing through nutrition, detox and alternative therapies. I can't help but think that if more people read this book and followed the suggestions, we wouldn't have one in ten people in the United States on anti-depressant medications. We are nutrient deficient in a land of plenty. Rebuild from Depression opens with Amanda's story of her depression during pregnancy and postpartum, and her journey to recovery. Amanda was hit hard with depression during pregnancy, even though she was “eating healthy” according to mainstream diet trends. Reluctant to resort to medication while pregnant, she started researching alternatives. This led her to find out that there was a family history of depression associated with pregnancy, and that her mother had found relief from her depression by accident while changing her diet to address other symptoms. I wish I had read this book after I had my first son, because I crashed pretty hard. My eldest was colicky and ate voraciously, and I was perpetually exhausted. Maybe if I had known about nutrients my body was likely to be lacking at that time (this was back before I ditched processed foods and raised much of my own food), I could have changed my diet and helped both of us to get through that time a little easier. It was very brave of Amanda to share her story in all the gory details, right down to the OCD behavior, self-doubt and obsession with death. I faced some of those dark moments myself. If my son had had serious health complications (like Amanda's did), I don't know how I would have coped. Note: When I read at the end of the book that she had had a second (unplanned) successful pregnancy depression free at the end of the book, I want to cheer out loud. Healing is possible! We need more books like this. We need to talk to each other and support each other, so moms don't think they're suffering alone. Later in the book, Amanda introduces a step by step strategy for overcoming depression, including identifying and removing potential toxins, introducing targeted supplements and eating with depression-busting nutrients in mind. She found that she was allergic to corn, facing a yeast overgrowth and poisoned from heavy metals. Think it can't happen to you? Corn is in nearly 4,000 items in a typical grocery store, and most of our corn is GMO. With our reliance on antibiotics and processed foods (as a society), most of us have gut bacteria that is out of whack. Heavy metals are found in many ground water supplies. Mercury is still used in amalgam fillings and vaccines. Lead paint can still be found in some buildings, as can lead contaminated soil from paint or contamination in heavy traffic areas from before lead was removed from gasoline. With counseling and amino acids, she found relief from many of her symptoms, but not all of them. Diet was the final key. In the final chapters of the book, Amanda outlines the top depression busting nutrients and the best food sources for each of them. She is very understanding of vegan and vegetarian lifestyles, since she was a vegetarian through much of her life. That said, she currently eats as an omnivore since it is an easier way to get the needed nutrients. Of course, no one vitamin or mineral acts in isolation, so please don't just go out and buy a bunch of supplements and start popping pills. If you're not sure you want to invest in the book right away, you can take a look at the Rebuild from Depression blog to give you some ideas of where to get started. In the book, Amanda outlines which food groups to look for and how to properly prepare them to maximize nutrition. If you've never heard of soaking and fermenting and the benefits of wild game and grass fed meats, this section will be a real eye opener. For those who are familiar with the Weston A. Price Foundation/Nourishing Traditions recommendations or Deep Nutrition, some of this will be familiar territory. Rebuild from Depression offers hope and guidance in an easily readable format. Small steps can make a big difference in your health. 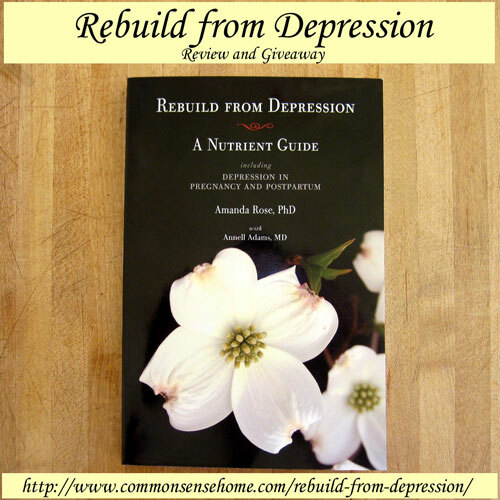 Amanda has generously offered to give one lucky Common Sense Home reader a free copy of Rebuild from Depression. To enter, simply use the Rafflecopter widget below (email subscribers please click through to the site). For your first entry, leave a blog post comment telling us why you'd like to win. Facebook and Twitter users can earn additional entries. No purchase necessary to win. Open to residents of the US and Canada ages 18 and older. This is not a paid promotion. Amanda provided a book for review and I agreed to share my opinion of it with you. This giveaway is now over. I have been on meds for depression for over 30 years and have been slowly weaning myself off them. This books sounds like just what I need to get off the last few. I’m currently struggling with a minor depression, and am trying to over come it by being positive and up best… It’s not working as well as I’d like. I’m pretty poor, so I would like a copy to help me over come this state without breaking the bank. I’ve been battling depression for years. I’ve battled it through infertility, pregnancy, post-partum and still continue to battle it now. I’ve been trying to detoxify my body and other natural means of handling/curing my depression as I am feeling the medication I am taking isn’t working as well as it used to. I would like to learn how to heal my depression naturally and hope healing my depression will help with other problems I have. I want to win the book. I really need it! I suffer form mild depression. I’ve been on anti-depressants for almost 10 years. I’ve tried many times to decrease or eliminate the meds… with no luck 🙁 Maybe this book could help! I would like to win this book because I have been on medication for depression for over 10 years. It has lost its effectiveness in my opinion. I feel as if the depression will be a part of who I am until I die. I remember being so happy and just want that ever so much, again! Thanks for the chance to win! It’s a great book, I’d love to have my own copy. I’ve been battling depression for 18 years. I have tried several times to get off my medications with minimal success. I would love to win this book and arm myself with more information so that next time I can be successful! I am hoping I can win this book, as I have battled depression for five years. I stopped taking medications because thats all my dr. wanted to do. She just kept throwing pills down my throat. Recently is the first time in five years that I feel like I have emotions again. I hope I can finish my recovery with this book. Thank you. We know many people battling depression. The book would be priceless for us! I’m interested in learning as much as I can about alternative healing using non-pharmaceutically based methods including nutrition and detox, and this book happens to be on my “wish list” on Amazon! I love your Common Sense website info, by the way! Thank you for the opportunity to enter to win! I think more people, women, especially, need to know exactly what depression is and what it cause.. I have been on Zoloft for 3 years, I started weaning myself off of it in January. I am down to 25mg daily, I have had horrible anxiety, heart palpitations and body aches coming off. I NEVER want to go through this again. I have been switching to a more traditional diet since I had c-diff last fall. I now make my own yogurt, kambucha, kefir, sour dough foods, etc. This book is available at just the right time for me. Thanks for the opportunity! My daughter has fought depression since she was 14 years old. She got through her pregnancy without anti-depressants but had a horrible post-partum depression period. I would love to help her recover from depression and help her be healthier for a second pregnancy. I’d really like a copy of this book for my brother. He suffers from depression, and I have hopes that he’ll decide to get treatment someday. I have struggled with depression all of my adult life. I would love to find an alternative and read about someone else struggle. Thanks for all you do. Struggled with depression my whole adult life. No insurance, on fluoxetine for a long long time, Hope I win. Wish I had this available to me after my first. The diet issues make so much sense! I eat really well while I was pregnant but i had a c-section so after she was born we went back to eating premade food at the grocery store. Which means a lot of processed food. I did lose an of my weight either that was the first thing I worked on when I started to come out of the depression. So I again started to eat better but still not great. I’d love to win this book to help me with our diets right now. My husband is going through Chemo and has shown signs of Depression for years but won’t do anything about it. This help me make the changes I need to his diet to bring him around. I’d love to have this book for myself first, then potentially to lend to others. Thanks for the chance to win! I would love to win this book because I am a huge advocate that the way we eat causes many of our psychological and physical health problems. I have suffered on and off for years with mild depression. I am currently reinventing the way I eat in hopes of curing it once and for all. I have been a very picky eater ever since I can remember. I’ve had depression symptoms as far back as probably about age seven. I’ve tried anti depressants and they never helped me feel any better. Maybe a bit easier to cope with symptoms, but never a great improvement. I would be on them for a year or so, quit, live a year, crash again, all the while eating as unhealthily as possible and just thinking I was born defective. I stumbled across blending information online a long time ago, and thought- well I can’t eat my vegetables, so I could possibly drink them… and then sat on the idea for a long time. I started in earnest about 2 months ago, and the results have been better than I could have hoped for. Now I know a lot of reasons why I had symptoms, and now that I have the nutrition aspect being addressed I actually have more room in my thinking (cause my brain works better!) to set in motion behavior and thought modifying mechanisms I had been trying in vain to learn, use, apply. I truly am getting better, something I had really written off a few years back. I would love to be the winner of this giveaway because I feel I really could benefit from more specific nutritive direction – if flying by the seat of my pants with a blender has taken me this far then there’s no telling where I could be in another 6 months time with the right direction, written specifically for someone like me who is working toward rebuilding my body and mind to a sound state. I would love this book as I can read it and help my family, My dad is 70 and is in an extreme amount of pain and unable to do any of the things he used to do and he is extremely depressed and I am afraid he will do something stupid. My daughter in law is going through a bought of depression and my grand kids and son are suffering, It would be good to pass to her to read and maybe she will get out of her fog. Plus I know I will need this soon as my hubby is dieing of cancer and he is my soul mate. This sounds like a great book for myself and loved ones, who seem to all struggle with depression from time to time. Depression and I are long-time companions. Winter is especially rough for me. I’m a gardener and being out in the sunshine the rest of the year staves off most of my blues. But come February, I find myself in a hole it’s hard to dig my way out of. I know I eat differently in winter too; too much junk and “comfort food”, in an effort to make myself feel better. Only I’m worse. I would love to have this book in my traditional wellness library. I have multiple family members, as well as myself, that have struggled with depression for years and I would love to be able to live my life without depression and share this with my family and friends. My entire family has dealt with the consequences of depression, including general anxiety and PTSD. We don’t celebrate holidays or birthdays or do much of anything together. Most of them won’t take any medication so my family has literally fallen apart. However, I do think they would be try a natural approach like this. I can think of at least 10 members off the top of my head who would benefit from this information. Please consider us for the book give-away. Thank you. I’ve struggled with depression since birth of youngest child nearly 10 years ago. I’m on meds. Without them I sink into a dark horrible hole. Would love to read this book. Thanks for the give away. I have struggled with depression whiel pregnant with 2 past pregnancies and also bad post pardum with both. I am currently pregnant with my 3rd and would like to make this as easy and depression free as I can. I would love to have this book because I’m struggling to detox from 20 years of depression meds with very little support. Rebuilding is HARD. Thanks for sharing!! Have battled depression off and on forever and of late it seems to be winning due to battles with fybromyalgia along with chronic fatique. Heading over to check out the blog and just may have to figure out how to come up with the moola to purchase the book ! I have battled with depression for over 25 years. I have been on medication for about 20 years. This last year I have started to feel that some changes needed to be made. I am trying to find other ways to deal with it without meds. This book looks like something I need to read! I hope I win it! I would love to win this book. I have been battling depression and anxiety for over 20 years and to add insult to injury I was diagnosed with Lupus 8 years ago. I am now unable to work due to severe pain and this takes a toll on my mental health. I think this book would help guide me to feeling better about myself. I struggled with depression throughout college. I’m happy to say now I overcame it, and am working towards becoming a spiritual counselor. This could be a nice book to add to my repetoire! I have been learning more about this very subject. This looks like a good book. I have a passion for helping pregnant and new moms, this would be a great asset to me. It sounds like there’s some great information in this book and I’m trying to get pregnant right now and I think it would really help me out. I really enjoy reading and this book looks like i would really enjoy it. Please only send it if this is a book. I do not own a Kindle so I do not know how to read the ebooks. i hope that sometime in the near future that I will be able to get one. thanks! I am studying for Nat. Pract. and think this would be a nice asset for my library. I have been on antidepressents for 6 years and would love an alternative method of fighting it. Have suffered depression most of adult life, put on Paxil, Prozac and Lexapro, each with side effects that brought on more trauma, i.e. prompting suicidal thoughts and behavior. Do believe God has provided us with what we need in natural resources and would appreciate reading your journey into healing naturally and it be a invaluable ‘prescription’ for us with similar needs. Have suffered depression most of adult life with ups n downs in severity. At different times put on antidepressants but they had serious side effects. I’ve come to embrace the idea that God provides all we need naturally and would truely appreciate reading your journey into healing naturally. I worked so hard at becoming healthy over the past 3 years and was finally at a point of getting off all my 9 meds for sleep, GERD, asthma, anxiety, PTSD, etc. And now I’m falling back into a depression because I got a blood clot after a surgical procedure and now on blood thinners that limit my healthy food sources that helped me with my depression. Limitations or exclusions are dark green leafy stuff, ginger, fish oils, green tea, vit D w/K, etc. I’ve also encountered limited exercise due to knee problems which also helped with depression. So here I am again. I need some motivation and guidance. !! This is such a delicate subject for many of us! I think it will be a terrific blessing to so many ladies! I’m so glad to have found this book. God gave us so many wonderful options for our health that sometimes the blessing can be overwhelming. It will be good to read one person’s account of what worked for them. I am also so happy to see another woman speaking candidly about her experience, we all need to be real and support each other instead of keeping ourselves hidden and competing. What a brave woman. Id love this book. So many of my friends and family suffer from depression and Im often unable to help.. I would like to win this to help with the depression I have battled since childhood. I am slowly weaning myself off of several antidepressants and would love to win this!! pretty darn cool! good luck everyone. As someone who has had my moments of the blues and hates taking pills and would rather go the herbalist route is why I would want this book. I think its something that got lost along the way only to be rediscovered again so it seems as some many different herbs can do some amazing healing.